It’s a bit of a departure from my daily routine but I would like to wear a touch of makeup on my Wedding day. It’s not unusual for me to wear something on special occasions so I decided to start the search for the perfect lipstick. After I was disappointed by Lippy Girl, I turned my attention to Red Apple Lipstick. This USA brand has taken the Green Beauty scene by storm with good reviews flooding the blogging community. I was delighted to be offered the opportunity to sample for myself and I spent hours looking at videos and swatches deciding on colours. It’s the one disadvantage with shopping online, screens can alter the colours and I didn’t want to be disappointed in my quest for the perfect bridal lippie. In the end I settled on Secrets and Twist n Pout and Red Apple Lipstick surprised me with the addition of a gloss called Bridesmaid. I now understand what all the fuss is about. 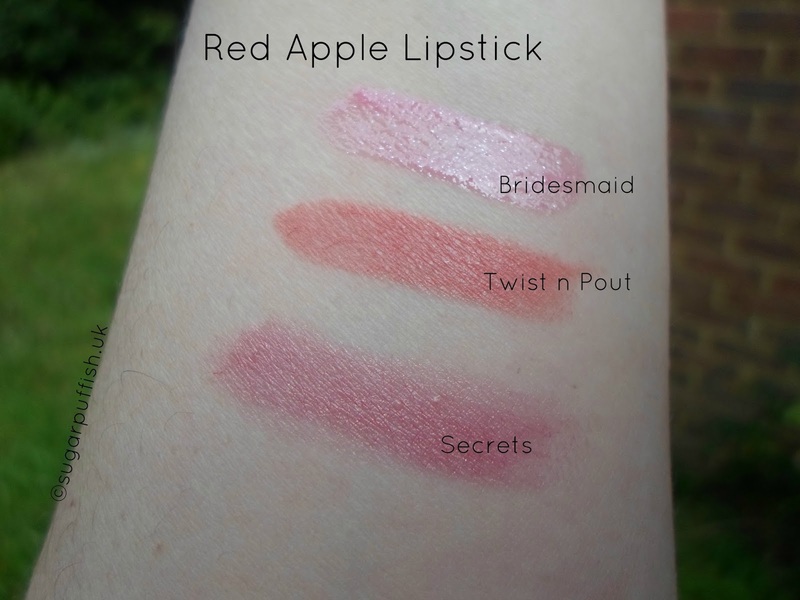 Red Apple Lipsticks are beautiful not just in colours but also buttery and soft on the lips. I often find lipsticks dry out my skin and I am left feeling uncomfortable but not with these. Packaging and quality easily rival the mainstream brands and it is also worth noting for Coeliac readers that Red Apple Lipstick’s products are Gluten Free. The are also free from soy, dairy, parabens, petrochemicals and animal ingredients. Secrets - described as “a pink/fuschia-y moisturizing lipstick, with a deep gold shimmer”. Secrets is subtle on my lips, you could say “my lips but better” as it enhances my natural pink skin tone and looks beautiful on its own or with a swipe of Bridesmaid gloss over the top. It is fair to say Secrets has won my heart and I would be happy to wear on my Wedding Day. Twist n Pout – described as “a warm-toned middle pink with a hint of coral, that's your lips but better. The perfect no-lipstick-lipstick for warm toned or neutral gals.” A lovely pop of colour but not quite what I had in mind for me as a little too coral on my lips. Bridesmaid - is a shiny sheer pink with lots of sparkle, I’m not a massive fan of gloss but this isn’t too sticky and looks great worn alone or paired with a lipstick. Staying power for these products is as I would expect, you do need to re-apply after eating and drinking. My chosen colours don’t add any staining to my lips which isn’t a deal breaker for me. 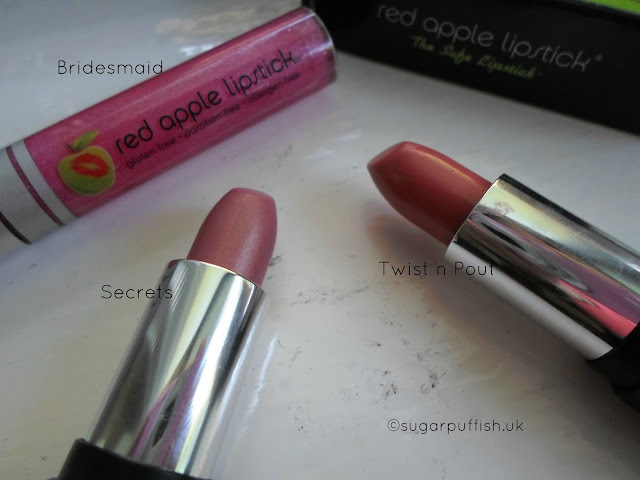 Red Apple Lipsticks do ship to the UK but it isn’t the cheapest. Samples are available and the blister packs give you a sizeable amount of colour to try. I have a sample of Hibiskiss which is a lovely raspberry colour which you can either use as a subtle stain or a bold pop of deep pink. I definitely appreciate these gorgeous lipsticks and I'm joining the Red Apple fan club. Have you tried Red Apple Lipsticks? Do you have a favourite colour? Secrets seems like such a pretty hue! I'd love to try more from Red Apple Lipstick.